In the heat of the Arizona desert, a raging fire pushes temperatures to a deadly degree, and one woman is left to burn. Pulled naked and barely breathing from the fire, the victim has no idea who she is, let alone who would do this to her -- or why. In her hospital bed she drifts in and out of consciousness, her only means of communicating a blink of the eye. And then an angel appears. Misguidedly known around town as the 'Angel of Death,' Sister Anselm has devoted her life to working as an advocate for unidentified patients. To her burn patient, she is a savior. But to this Jane Doe's would-be killer, Sister Anselm's efforts pose a serious threat. Ali Reynolds is on the scene as the new media relations consultant for the Yavapai County Police Department, keeping reporters at bay and circumventing questions about arson and a link to a domestic terrorist group called Earth Liberation Front. But her job quickly becomes much more. As Ali struggles to help Sister Anselm uncover the helpless woman's identity, they realize that by locating the missing relatives they may be exposing the victim once more to a remorseless killer determined to finish the job. Faced with the possibility of putting all three of their lives in jeopardy, Ali fearlessly pursues justice -- and what she discovers is a secret even darker and more twisted than she ever could have imagined. With unerring skill, Jance delivers relentless suspense in what is surely her finest novel yet in this riveting and addictive series. Maybe it's because I've just finished listening to fabulously written and read Henning Mankell, but J. 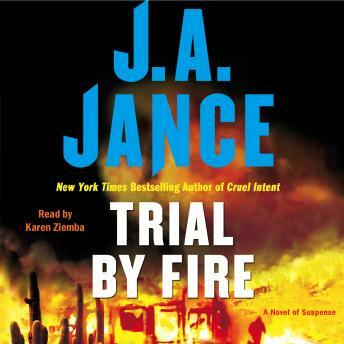 A. Jance book is atrociously bad. A high-school / young adult fiction level, very patronizing and in a trying-to-be-cooler-than-ice kind of way. I listened to it for ten minutes (10 !) and gave up. I've never given up on a book this quickly, particularly since it takes me an hour to get to work in the morning. This morning I drove in silence. I'd also taken every book by this author that I had in my queue out. basic who done it type of story. Really enjoyed the heroine main character. Enough action to keep it moving without dragging on too long. Will definitely listen to more of Jance's work.